Back in June, news broke that Chicago Blackhawks goaltending prospect Ivan Nalimov wanted out of their system in order to receive a better chance at an NHL future. Nalimov requested for his rights to be traded despite not even having a contract with Chicago, hoping for a direct line to playing time in North America. The Blackhawks had Corey Crawford and Anton Forsberg at the time, and have also added Cam Ward since then. According to Scott Powers of The Athletic (subscription required), Nalimov has rescinded that trade request after speaking with the Blackhawks GM Stan Bowman, and is now focused on spending the 2018-19 season in the KHL. Nalimov will play for Kunlun Red Star this season after a tumultuous 2017-18 campaign that saw his contract terminated midseason due to the financial struggles of his former team. In 23 games split between Admiral Vladivostok and Salavat Yulaev Ufa though, he was one of the KHL’s best goaltenders with a .938 save percentage. That number is actually slightly better than Mikko Koskinen who signed with the Edmonton Oilers, and New York Islanders prospect Ilya Sorokin who is considered one of the top goaltending prospects in the world. While Nalimov may not have that kind of world class potential, he’s a very interesting option for the Blackhawks going forward. 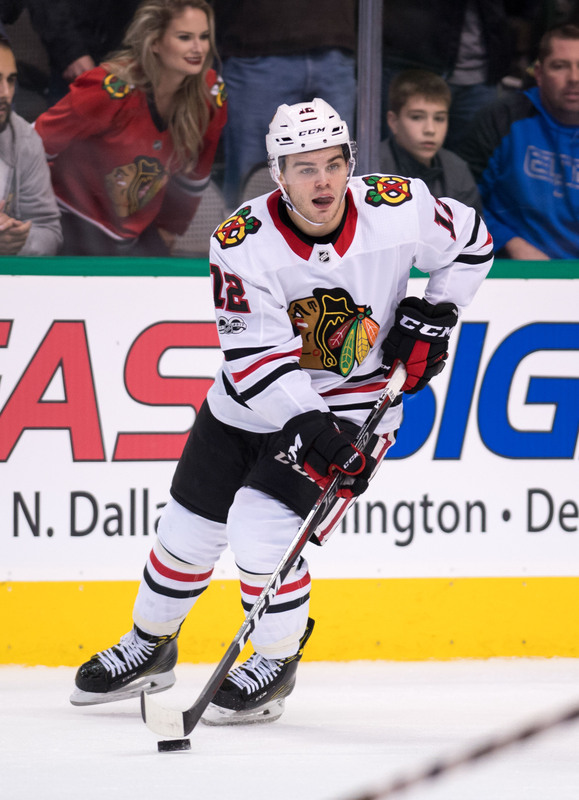 With Crawford’s health still up in the air and Ward on just a one-year contract, perhaps there could be an opportunity in Chicago during the 2019-20 season. Nalimov is under contract for just one season in the KHL, and hopes to come to North America afterwards. The sixth-round pick could provide an unexpected boost to the Blackhawks going forward, especially if he once again shows his skill in the KHL. It’s not often that a player not under contract requests a trade, but Ivan Nalimov is going for it. The Chicago Blackhawks’ 2014 sixth-round pick has asked for his rights to be dealt to another NHL team, reports The Athletic’s Scott Powers. As one of the KHL’s best young goaltenders, Nalimov feels that he has earned a shot at the NHL next season, but agent Shumi Babaev feels that the opportunity won’t come in Chicago. Nalimov has already terminated his KHL contract for next season and is solely focused on the NHL, but doesn’t want to waste the prime of his career buried in the minors behind the Blackhawks’ many goalies. As a result, the young netminder would like to be moved to a team where he might have a greater chance at play time. Nalimov, 23, is coming off of a season that was impressive for many reasons. Right away, it is easy to tell that this was a career campaign for the homegrown Russian goaltender and former KHL first-round pick. The big keeper finally put it all together in 2017-18 and posted a .938 SV% and 2.13 GAA in 23 appearances. His save percentage was among the best in the league, fourth among all goalies with 20+ appearances, and his goals against average was in the top 15 of that same group. However, a closer inspection makes those numbers even more impressive, as Nalimov was traded mid-season. Serving behind Igor Bobkov with Admiral Vladisvostok, Nalimov proved himself to be the best backup in the KHL this season with a .942 SV% and 1.98 GAA in 17 games. With his value escalating, he was moved to Salavat Yulaev Ufa to back up Ben Scrivens and hardly missed a beat in six more games there. His numbers fell off slightly, but his performance trumped the team’s existing backup and helped Ufa in their playoff pursuit, earning Nalimov some postseason appearances of his own. Nalimov not only performed at a high level this year, but did so with two teams and was unshaken by the adjustment. It’s understandable why he feels now would be the perfect time to make the ultimate adjustment and try his hand at the NHL. Yet, Chicago is an unlikely location for that to happen. As Powers writes, the Blackhawks have three NHL-caliber goalies already under contract for next season in starter Corey Crawford and backups Anton Forsberg and J-F Berube, not to mention another pair of prospects signed to pro deals who already seem permanently relegated to the minors next season. In speaking with both Nalimov’s agent and Chicago GM Stan Bowman, Powers states that the ’Hawks really like Nalimov, but perhaps didn’t anticipate that he would develop this quickly or wish to come overseas this soon. They also might have underestimated his ceiling, as Chicago did spend a third-round pick on German standout Wouter Peeters just two years ago. Regardless, the Blackhawks do not have to listen to Nalimov’s request and they can retain his rights perpetually, but this could sour the young goalie on coming to North America altogether. If the decision is between potentially losing Nalimov forever due to a broken relationship or trading him away for at least some type of return, Bowman and company are likely to shop the prospect this summer. The Chicago Blackhawks have an interesting summer in front of them, as they try to turn around what was a disastrous season and compete again in 2018-19. The core of Jonathan Toews, Patrick Kane, Duncan Keith, Brent Seabrook and Corey Crawford will all be on the wrong side of 30 by the middle of November, making a rebuild out of the question. Our No. 1 priority as we move forward is to make sure we can keep these young players: [Alex] DeBrincat, [Nick] Schmaltz and [Vinnie] Hinostroza and some other young players. That’s the direction we’re headed. While it’s true that the Stanley Cup-winning core is heading out of their prime, the young blood that has joined the team is something to look forward to. DeBrincat led the team with 28 goals as a rookie and would be getting more attention for the Calder trophy in a regular year (that is, one without the outstanding crop of first-year players the league has seen) while Schmaltz slid into a role beside Kane and recorded 52 points. With the cap increasing by somewhere around $5MM, the Blackhawks should have a little money to play with in free agency if they so choose. As Lazerus reports though, Chicago won’t be handing out any long-term deals—meaning they’ll probably be out of the running on most of the top names. While that may be disappointing, the team has to still think of where their salary structure will sit in a few seasons when Schmaltz, DeBrincat and others do need raises. Andreas Athanasiou is back. The 23-year old forward that has spent the last few weeks holding out for a new contract, was on the ice for the Detroit Red Wings today, practicing with Frans Nielsen and Darren Helm. While there’s no clear indication when Athanasiou will get back into the lineup, it was a promising sign to have him working with the team. After a summer that was filled with speculation, rumor and intrigue, the Red Wings will welcome back their talented young sniper. Athanasiou has excellent speed and skill, and had just scratched the surface of his offensive potential last season, scoring 18 goals and 29 points. That number could increase this year even with the lost time, especially if given plenty of powerplay opportunities. The Red Wings, now losers of five straight, could use some offensive punch. They’ve scored just one goal in their last two games. Harri Sateri has been sent back to the AHL by the Florida Panthers, after the team claimed Antti Niemi off waivers yesterday. The 27-year old Sateri didn’t get into a game, and has a slow start in his return to North America. Originally a draft pick of the San Jose Sharks, Sateri left for the KHL in 2014 where he found immediate success. Earlier this summer he turned down an extension with his KHL club in order to try and secure and NHL job, and eventually signed a two-way deal with Florida to essentially be their #3. With a .859 save percentage in the AHL, and now Niemi in the fold, he’ll have to play better if he wants to get a crack at a full-time NHL role (even as a backup) down the road. Shane Doan has found the next chapter in his NHL career, as Pierre LeBrun of The Athletic reports that the former Arizona Coyotes’ captain will join the league’s Hockey Operations group. Working with Colin Campbell, Doan will follow the path set out by other former players like Brendan Shanahan and Rob Blake. Shanahan and Blake of course are now running franchises in Toronto and Los Angeles. Johnny Oduya is a name that has fallen off most hockey fanatics’ radar this off-season, and perhaps there is good reason for that. Oduya is 35 years old and came off a brutal playoff performance in their sweep against Nashville. The league is certainly trending in the “what have you done for me lately” direction, so no one should be entirely shocked that he remains unclaimed this deep into July. That said, it’s still conceivable that he has a bounce back year. For a bargain bin price, he’s worth taking a shot on. Although his dreadful 2016-17 outing had him finish with only 9 points and an uninspiring 46.8% Corsi For, he’d been above the 50% mark the prior 5 seasons. He can lo longer handle a ton of minutes, and he will need sheltering from top competition, as many bottom-pairing defensemen do. He only averaged 18:16 of ice-time through the year, but considering that 59.3% of his zone starts were in the defensive end, he managed to hold his own. As a veteran 6th or 7th defenseman, he may still have something to offer. The Blackhawks are seemingly always looking to re-unite with names from their past glories, but the fit may not be one Stan Bowman is willing to try again. He looked sluggish and out of sorts, and got blown by on numerous occasion by the depth players of Nashville. That said, the team will likely need at least another defenseman on the roster, so it’s not impossible. But with Duncan Keith (34), Brent Seabrook (32), and Michal Rozsival (38) already making up half the defense, do they really want to get older still? Oduya hasn’t been definitively linked to practically anyone. It’s quite possible he’s holding on to see what opens up as teams enter training camp. Teams like the Washington Capitals, Philadelphia Flyers, and Los Angeles Kings could use another 6/7, and would be on the hunt for a bargain. The New Jersey Devils of course completely lacking on the back-end, and might want a mentor for 22 year olds Mirco Mueller, Damon Severson, and Michael Kapla. In truth, a good 50% of the league that could afford to take a chance on him for a single season, but the question remains, who will? Ultimately, we aren’t likely to hear much chatter on this front until the arbitration period has passed. Teams want to have their organizational contracts set in stone before offering a contract to what will ultimately amount to a stop-gap defender solution. Last month, we projected a one-year, $2.5MM deal for Oduya back with Chicago, but they certainly no longer have him in their plans. We had him ranked at a respectable 32nd in a weak UFA class, but even that may have been overestimating his remaining value around the league. Oduya will likely have to settle for a one-year deal to prove he still “has it”, and the monetary value of that contract will be far less. He could always decide to play in Europe, but at the bare minimum he’ll attract at PTO, much like Cody Franson. If he does sign before the end of summer, it will likely be for under $1 MM, quite the paycut from his 2016-17 AAV of $3.75 MM.